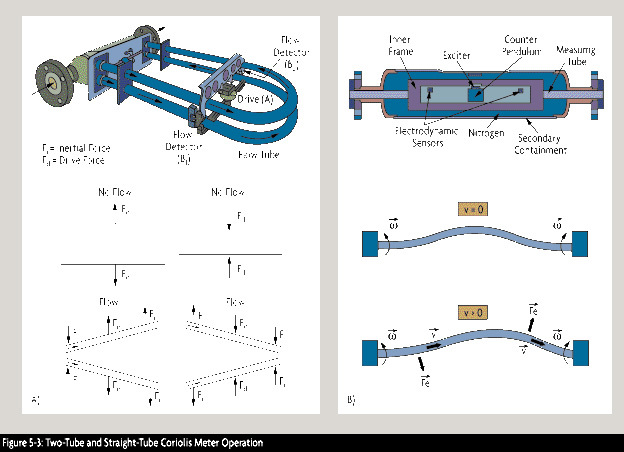 Coriolis flow meters artificially introduce a Coriolis acceleration into the flowing stream and measure mass flow by detecting the resulting angular momentum. The first industrial Coriolis patents date back to the 1950s, and the first Coriolis mass flow meters were built in the 1970s. When a fluid is flowing in a pipe and it is subjected to Coriolis acceleration through the mechanical introduction of apparent rotation into the pipe, the amount of deflecting force generated by the Coriolis inertial effect will be a function of the mass flow rate of the fluid. If a pipe is rotated around a point while liquid is flowing through it (toward or away from the center of rotation), that fluid will generate an inertial force (acting on the pipe) that will be at right angles to the direction of the flow. How does the Coriolis Flow meter calculate the flow? This is how measurement of the Coriolis force exerted by the flowing fluid on the rotating tube can provide an indication of mass flowrate. Naturally, rotating a tube is not practical when building a commercial Coriolis mass flow meter, but oscillating or vibrating the tube can achieve the same effect. Coriolis flow meters can measure flow through the tube in either the forward or reverse directions. In most designs, the tube is anchored at two points and vibrated between these anchors. This configuration can be envisioned as vibrating a spring and mass assembly. Once placed in motion, a spring and mass assembly will vibrate at its resonant frequency, which is a function of the mass of that assembly. This resonant frequency is selected because the smallest driving force is needed to keep the filled tube in constant vibration. The first generation of Coriolis flow meters consisted of a single curved and a thin-walled tube, in which high fluid velocities were created by reducing the tube cross-sectional area in relation to the process pipe. The tube distortion was measured in reference to a fixed point or plane. The tubes were excited in such a way that localized high amplitude bending forces were created at the anchor points. This resulted in severe vibration problems, which were alleviated by two-tube designs. These designs reduced external vibration interference, decreased the power needed to vibrate the tubes, and minimized the vibrational energy leaving the tube structure. One driver was used to initiate tube vibration, and two sensors were used to detect the Coriolis deflections. While this design greatly improved the performance of the Coriolis flow meters, the combination of reduced bore, thin-walled tubing, and high fluid velocities (up to 50 ft/sec) still resulted in premature meter failure, including potentially catastrophic spills when the meter was used on corrosive and erosive services. In addition, the unrecovered head losses were high (sometimes over 50 psid), and accuracy was not high enough to allow users to convert batch processes into continuous ones. More recent design improvements of Coriolis flow meters include the introduction of a variety of new tube shapes, including ones that do not split the flow and the use of multiple drivers. Thick-walled tubing (five times thicker than early designs), the use of full bore diameters and heavy manifolds to isolate the tube structure from stresses induced from piping connections, and flowtube housings that double as secondary containment vessels have all contributed to improved performance. In some designs, torsional stresses replaced bending, in order to prevent the concentration of stresses that can lead to tube cracking. In other Coriolis meter designs, the effects of pipeline vibration have been minimized by mounting the tube structures transverse to the pipeline. These improvements increased the number of suppliers and contributed to the development of a new generation of Coriolis flow meters that are as reliable and rugged as traditional volumetric flow meters. The new designs operate at lower fluid velocities (below 10 ft/sec) and at lower pressure drops (under 12 psid), can be installed in any orientation, and provide longer service life on slurry, viscous, corrosive, or erosive services. The tubes are vibrated well below their endurance limits, and typically are made of stainless steel, Hastelloy, and titanium. There are no Reynolds number limitations associated with Coriolis mass flow meters. They are also insensitive to velocity profile distortion and swirl. Therefore, there is no requirement for straight runs of relaxation piping upstream or downstream of the meter to condition the flow. The flow meter should be installed so that it will remain full of liquid and so air cannot get trapped inside the tubes. In sanitary installations, the meter must also drain completely. The most desirable installation is in vertical upward flow pipes, but installations in horizontal lines are also acceptable. Installations where the flow is downward in a vertical pipe are not recommended. In newer Coriolis designs, normal pipe vibration should not affect the performance of the Coriolis meter if it is properly supported by the process piping. No special supports or pads are needed for the flow tube, but standard piping supports should be located on either side of the meter. If the installation instructions require special hardware or supports, the particular meter design is likely to be sensitive to vibration, and the pulsation dampeners, flexible connectors, and mounting/clamping attachments recommended by the manufacturer should be carefully installed. If your application requires that you install two Coriolis flow meters in series or mount two Coriolis meters near each other, the manufacturer should be consulted to prevent crosstalk between the two units. Common piping used for pumping into and out of storage tanks. Allowing the formation of a vortex in stirred vessels under low-level conditions. Allowing air leakage through packing glands of pumps that develop high vacuums on the suction side (this can occur when pumping from underground storage). Vaporization of stagnant process fluid in pipes exposed to the sun. High valve pressure drops causing vaporization and flashing. Allowing the pipe to drain for any reason, including lack of check valves. Allowing storage tanks, trucks, or railroad cars to drain completely. Using the same pipe for pumping different materials at different times. Allowing foam formation by high turbulence in high velocity fluids. It is recommended to install (upstream of the meter) strainers, filters or air/vapor eliminators as required to remove all undesirable secondary phases. Its function is to slow the velocity of the liquid, thereby allowing time for the entrained air to separate and be removed by venting. The rise and fall of the liquid level in the eliminator due to the accumulation of free air closes and opens the vent valve and discharges the air. Prior to zeroing the Coriolis flow meter, all air should be removed. This can be accomplished by circulating the process fluid through the meter for several minutes at a velocity of approximately 2-6 ft/sec. On batching or other intermittent flow applications, the meter should stay flooded so that it does not need to be repurged. All meters should be so installed so they can be zeroed while filled with liquid. When zeroing the meter, any associated pumps or other equipment should be running so that their noise can be zeroed out. This can be achieved in most cases by locating a shut-off value downstream of the Coriolis meter and either operating the pump with its discharge blocked, which is acceptable with centrifugal pumps for a short period, or by opening the pump bypass on positive displacement pumps. Valves used in zeroing the meter should provide tight shut-off; double-seated valves are preferred. Flow meters that are expected to be calibrated in-line must be provided with block and bypass valves so that the reference standard (master) meter can be installed and disconnected without interrupting the process. The requirements for in-line calibration (for ISO 9000 verification) consist of comparing the output of the meter against a reference standard of higher accuracy, such as a dead-weight calibrated weigh tank. Before Coriolis meters, the reference standard was expected to be an order of magnitude more accurate than the meter being calibrated; however, due to the high accuracy of Coriolis flow meters, this is rare. In less critical installations (where weigh tanks are not used), volumetric provers or master meters (typically another Coriolis or a turbine meter calibrated at a flow laboratory) are used. When a volumetric reference is used in calibrating a mass flow meter, the fluid density must be very precisely determined. 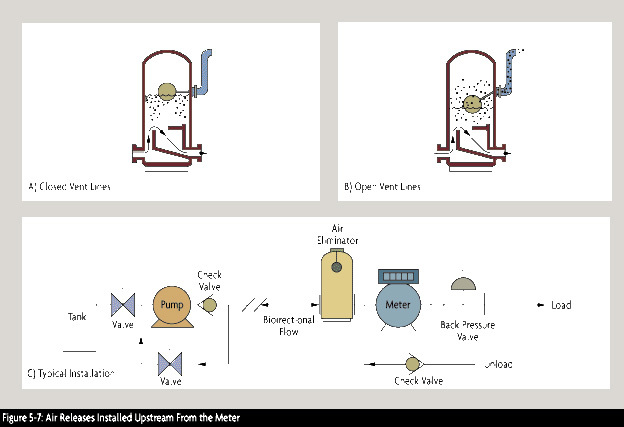 Control valves should be installed downstream of the meter to increase the back-pressure on the meter and lower the probability of cavitation or flashing. When the process fluid must be held at higher temperatures, some Coriolis meters can be supplied with steam jackets. As an alternative, electrical heating tape can be added to the housing. Jackets or heating tapes must be installed by the manufacturer. When flow metering is not required, the Coriolis flow meter can be used solely as a densitometer. In that case, to minimize cost, usually a small ( 1/2 in.) meter is installed in a by-pass line. Such a configuration is acceptable only in clean services that will not clog the small bore of the meter. In addition, a restriction must be placed in the main piping (between the by-pass taps) to ensure a flow through the meter. Coriolis mass meters provide 0.1-2% of rate inaccuracy over a mass flow range of up to 100:1. In general, curved tube designs provide wider rangeability (100:1 to 200:1), while straight-tube meters are limited to 30:1 to 50:1 and their accuracy is lower. Overall meter error is the sum of base inaccuracy and zero-shift error, the error attributable to the irregular output signal generated at zero flow conditions. Zero-shift error becomes the dominant portion of total error at the lower end of the flow range, where the error is between 1% and 2% of rate. Some manufacturers state the overall accuracy as a percentage of rate for the upper portion of the flow range and as a percentage of span for the lower portion, while others state it as a percentage of rate plus a zero-shift error. There is a fair amount of "specmanship," and one must read sales literature carefully when comparing different devices. When used for density measurement, the typical error range of a Coriolis measurement is 0.002-0.0005 g/cc. Errors are caused by air or gas pockets in the process fluid. In the case of homogeneously dispersed small bubbles, more power is required to vibrate the tubes, whereas, if the gas phase separates from the liquid, a damping effect on tube vibration (and, consequently, error) develops. Small voids also cause noise because of the sloshing of the process liquid in the tubes. Larger voids will raise the energy required to vibrate the tubes to excessive levels and may cause complete failure. Because the flowtube is subjected to axial, bending, and torsional forces during meter operation, if process or ambient temperature and pressure fluctuations alter these forces, performance may be affected and re-zeroing of the meter may be required. 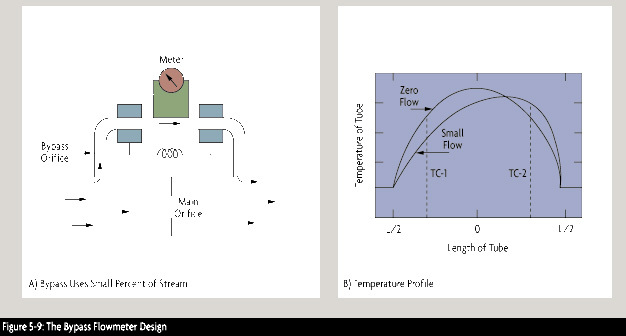 Variations in the density of the process fluid can affect the frequency transfer function of mechanical systems, necessitating the re-zeroing of older designs to protect them from degraded performance. Because of their tube configurations, newer designs are unaffected by density changes over wide ranges of specific gravity variations. A tube can be of a curved or straight form, and some designs can also be self-draining when mounted vertically. When the design consists of two parallel tubes, flow is divided into two streams by a splitter near the meter's inlet and is recombined at the exit. In the single continuous tube design (or in two tubes joined in series), the flow is not split inside the meter. In either case, drivers vibrate the tubes. These drivers consist of a coil connected to one tube and a magnet connected to the other. The transmitter applies an alternating current to the coil, which causes the magnet to be attracted and repelled by turns, thereby forcing the tubes towards and away from one another. The flow sensor can detect the position, velocity, or acceleration of the tubes. If electromagnetic sensors are used, the magnet and coil in the sensor change their relative positions as the tubes vibrate, causing a change in the magnetic field of the coil. Therefore, the sinusoidal voltage output from the coil represents the motion of the tubes. When there is no flow in a two- tube design, the vibration caused by the coil and magnet drive results in identical displacements at the two sensing points. When flow is present, Coriolis forces act to produce a secondary twisting vibration, resulting in a small phase difference in the relative motions. This is detected at the sensing points. The deflection of the tubes caused by the Coriolis force only exists when both axial fluid flow and tube vibration are present. Vibration at zero flow, or flow without vibration, does not produce an output from the meter. Wall thickness varies considerably from design to design; however, even the sturdiest tubing will be thinner than the process piping. In addition, some designs use small bore tubing, which drastically increases the flowing velocity (from 5-10 ft/sec to more than 25 ft/sec). Designs with thin walls and high fluid velocities (that is, small bore tubing), may require the use of exotic materials because of erosion concerns. One will obtain the longest meter life by selecting the design with the thickest wall and the slowest flow velocity that can provide the required accuracy and range. The Coriolis mass flow meter may need to be made out of exotic materials because of corrosion considerations or to prevent pitting. Carbon or stainless steel can often be used in process piping, because a small amount of pitting can be tolerated. In case of the Coriolis meter, even a small amount of pitting cannot be tolerated because the walls are thin, and pitting induces stress concentrations within the tube structure. Therefore, standard corrosion tables (based on weight loss criteria) are not suitable for selecting Coriolis tube materials, and the stricter guidelines of the manufacturers must be used. Transmitters can operate on either ac or dc power and require separate wiring for the power supply and for their output signals. 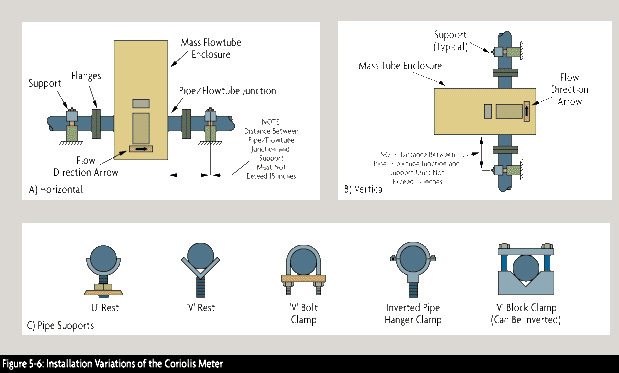 The Coriolis flow meter transmitter can be integrally or remotely mounted. The transmitter controls the operation of the driver and processes and transmits the sensor signals. The calibration factor (K) in the transmitter's memory matches the transmitter to the particular flow tube. This calibration factor defines the constant of proportionality between the Coriolis force and the mass flow rate for the dynamic spring constant of the particular vibrating tubes. The transmitter does more than convert sensor inputs into standardized output signals. Most transmitters also offer multiple outputs, including mass flow rate, total mass flow, density, and temperature. Analog and/or pulse outputs are both available, and intelligent transmitters can generate digital outputs for integration into DCS systems. Transmitters are often provided with a local displays and keypads to allow easy access to process data. Coriolis transmitters provide more than just flow information and ancillary functions. Batch control functions, percent Brix or percent HFCS monitoring, viscosity, percent solids, PID, API gravity, and specific gravity also are available. When viscosity information is desired, the meter pressure drop needs to be measured. Other features may require information to be pre-programmed into the transmitter memory. In addition, transmitters have other hardware and software options which allow the user to customize them to the application. The effect of the Coriolis force on the vibrating tube is small. Full-scale flow might cause a deflection of only 0.001 inch. To obtain a flow rangeability of 100:1, sensors must be able to detect deflections to an accuracy of 0.000001 inch in industrial environments where the process pressure, temperature, and fluid density are all changing, and where pipe vibration interferes with measurement. The elasticity of metal tubes changes with temperature; they become more elastic as they get warmer. To eliminate the corresponding measurement error, the tube temperature is continuously measured by an RTD element and is used to continuously compensate for variations in tube elasticity. Coriolis mass flow meters usually are calibrated on water, because the constants are valid for all other liquids. Calibration for density is usually done by filling the tubes with two or more (stagnant) calibration fluids of known densities. Because of the wide rangeability of Coriolis flow meters (30:1 to as high as 200:1), the same flow can be measured by two or three different sized flow tubes. By using the smallest possible meter, one will lower the initial cost and reduce coating build-up, but will increase erosion/corrosion rates and head loss, increasing pumping and operating costs. Downsizing (using a meter that is smaller than the pipe) is acceptable when the pipe is oversized and the process fluid is clean with a low viscosity. On corrosive, viscous, or abrasive slurry services, downsizing is not recommended. 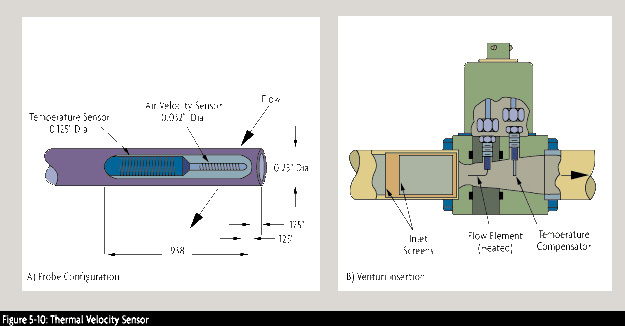 A list of acceptable flow tube sizes and corresponding pressure drops, inaccuracies, and flow velocities can be obtained from software provided by the manufacturer. Different Coriolis meters incur different pressure drops, but in general they require more than traditional volumetric meters, which usually operate at less than 10 psid. (The yearly electricity cost of pumping 1 gpm across a differential of 10 psid is about $5 U.S.). This higher head loss is due to the reduced tubing diameter and the circuitous path of flow. Besides pumping costs, head loss can be of concern if the meter is installed in a low-pressure system, or if there is a potential for cavitation or flashing, or if the fluid viscosity is very high. The viscosity of non-Newtonian fluids is a function of their flowing velocity. Dilettante fluids, for example, increase their apparent viscosity (resistance to flow) as their velocity is increased. This apparent viscosity can be drastically higher than their viscosity when stagnant. In order to provide suppliers with data on the flowing viscosity in a particular pipe, head loss per foot of pipe (used in pump sizing calculations) can be used as an approximation. Coriolis mass flow meters can detect the flow of all liquids, including Newtonian and non-Newtonian, as well as that of moderately dense gases. Self-draining designs are available for sanitary applications that meet clean-in-place requirements. Most mass meters are provided with intrinsically safe circuits between the flow tube and the transmitter. Therefore, the amount of driving power that can be delivered to the flow tube is limited. When fluid is unloaded from tank trucks, drums, or railroad cars, slug flow can occur, making the meter output unpredictable. If a slug-flow recovery feature is provided in the transmitter, it will stop the measurement when slug flow is detected by the excessive drive power drawn or by the drop in process density (reduction in sensor output amplitude). The amount of air in the process fluid that can be tolerated by a meter varies with the viscosity of the fluid. Liquids with viscosities as high as 300,000 centipoise can be metered with Coriolis meters. Gas content in such highly viscous liquids can be as high as 20% with the small bubbles still remaining homogeneously dispersed. Gas content in low viscosity fluids, like milk, will separate at concentrations as low as 1%. These mass flow meters provide short payback periods on applications where measurement accuracy lowers production costs (bathing, billing) or where multiple measurements (including density, temperature, pressure) are needed. On the other hand, they may not be competitive when used in simple flow measurement applications where volumetric sensors are sufficient and where repeatability is more important than precision. The ability to extract data on total mass charged, solids rate, percent solids, and viscosity from a single instrument does lower the total cost of measurement, improves process control, and provides redundancy for other instruments. Continuous tube designs are generally preferred for slurry and other multi-phase fluid applications. The total flow is divided by splitters in split-tube designs, and the resulting two streams do not have to be at exactly the same mass flow rate to maintain accuracy (they do, however, need to have the same density). 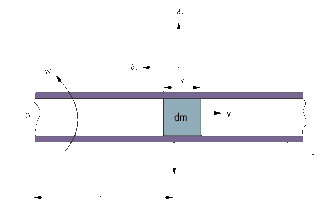 Different densities in the two parallel tubes imbalance the system and create measurement errors. Therefore, if there is a secondary phase in the stream, a simple flow splitter may not evenly distribute the flow between the two tubes. 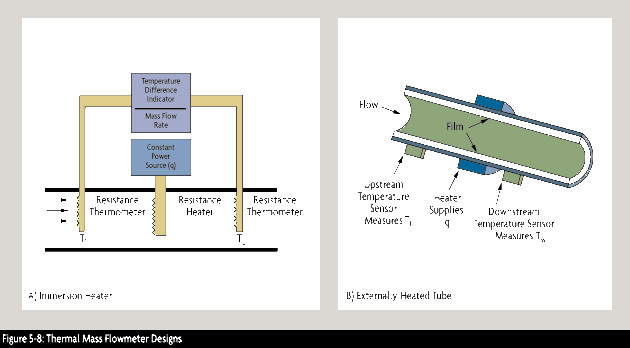 Continuous tube designs are also preferred for measuring fluids that can coat and/or clog the Coriolis meter. Continuous tubes, if sized to pass the largest solid particles in the process fluid, are less likely to clog and are easier to clean. Straight-tube designs can be cleaned by mechanical means, while curved-tube designs are usually washed out using cleaning solutions at velocities in excess of 10 ft/sec. Straight-tube designs also are preferred for sanitary applications due to self-draining requirements. Long, bent tubes twist more easily than do short, straight tubes and therefore will generate stronger signals under the same conditions. In general, curved-tube designs provide wider rangeability (100:1 to 200:1), while straight-tube meters are limited to 30:1 to 50:1, with lower accuracy. Straight-tube meters are more immune to pipeline stresses and vibration, are easy to install, require less pressure drop, can be mechanically cleaned, are more compact, and require less room for installation. They are also preferred on services where the process fluid can solidify at ambient temperatures. Not all meter housings are designed to withstand and contain the pressurized process fluid in case of tube rupture, particularly if the process fluid is likely to vaporize under such conditions. If that is the case, secondary containment housings can be ordered that enclose the entire flow tube, including its housing. Such secondary containment enclosures can be provided with rupture disks or pressure relief valves, and with drains or vents.